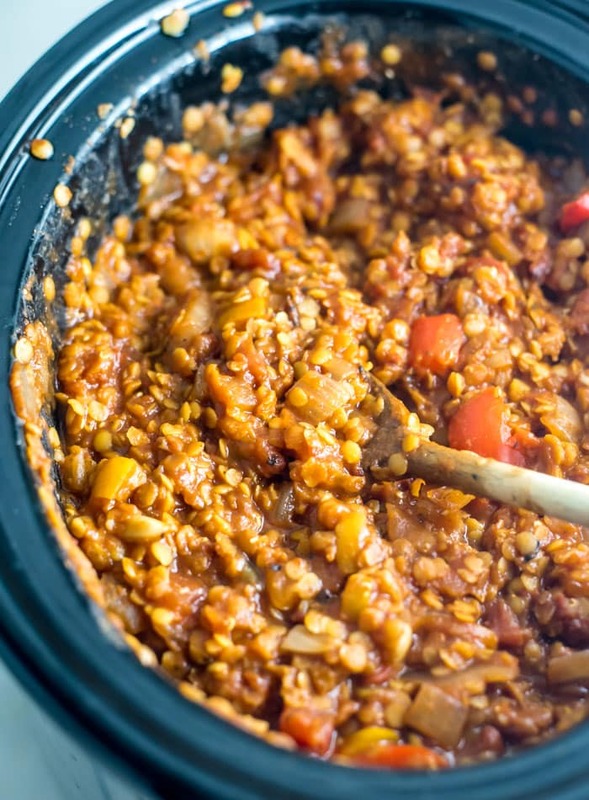 This slow cooker vegan red lentil chili is the perfect recipe for food prep. You can set-it-and-forget-it and the flavours improve the next day. 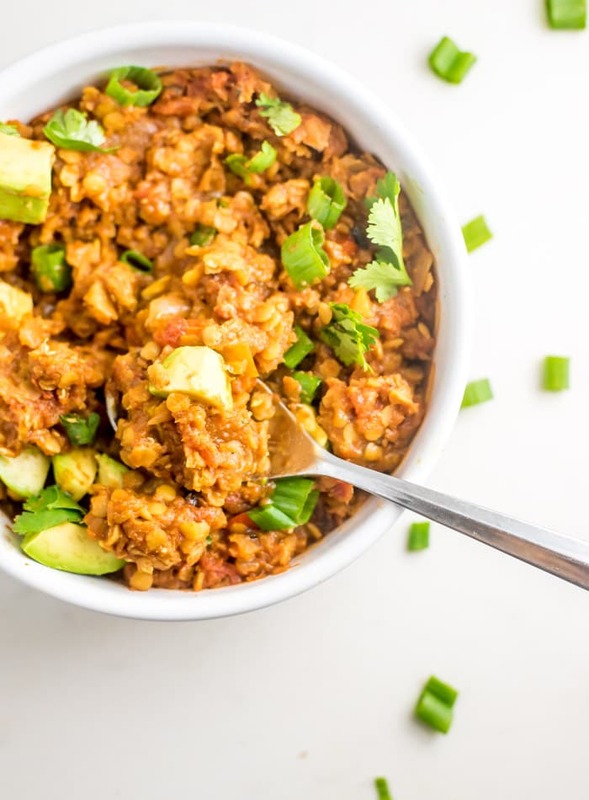 Cook a batch on a Sunday and enjoy throughout the week topped with avocado, cilantro, green onion and crushed tortilla chips. Lentils are one of my favourite foods for their many health benefits. Lentils are an excellent source of cholesterol-lowering fibre and not only do they help lower cholesterol they can help manage blood sugar disorders since their high-fibre content prevents blood sugar spikes after eating. Lentils have also been linked to reduced risk of breast cancer when eaten regularly and are high in many essential nutrients such as protein and folic acid. They’re also a good source of lysine, an essential amino acid that’s harder to come by if you eat a plant-based diet. Read more on vegan protein and amino acids here. This recipe is a breeze to make in a slow cooker but just as easy to cook stovetop if you’re looking to have it on the table in under 40 minutes. To make it stovetop, saute the onions and garlic in a splash of broth for 5 minutes or so then add the rest of the ingredients and bring to a light simmer. Let it simmer lightly for 25-30 minutes until the lentils are tender and the chili is nice and thick. Diced tomatoes. I love the organic fire-roasted diced tomatoes from Muir Glen (their cans are BPA-free too!) but any canned diced tomatoes will do. You’ll need one large 28 ounce can or two smaller 14.5 ounce canes. Chili spices. I used chili powder, cumin, smoked paprika (regular paprika is fine) and oregano. The chili powder is essential but if you don’t have paprika, cumin and oregano on hand, no worries. Use what you have, it won’t make or break the recipe. Vegetables. I kept things simple for this recipe and used onion, carrot, jalapeno, garlic and bell peppers. Feel free to add a few more veggies if you feel like it. Some corn would be yummy or try some diced zucchini or sweet potato. Red lentils. You’ll need 1 1/2 cups of uncooked red lentils for this recipe. I would recommend using red lentils over over green as green lentils hold their shape when cooked whereas red lentils tend to cook up much softer, kinda mushy really, so while you could use green lentils in this recipe, the final result would have a very different texture. Vegetable broth. I used 2 cups of veggie broth for the the cooking liquid but you can use water in a pinch. This hearty, nourishing chili is perfect for chilly weather. It will warm you right up. It’s also a great recipe for food prep as you can throw it all in the slow cooker at the start of your prep and let it cook while you finish your other prep items. It tastes even better the next day too, so leftovers are no problem. It also freezes well so if you’re batch cooking, it can be tucked away in the freezer so you’ve got it ready when you need it. 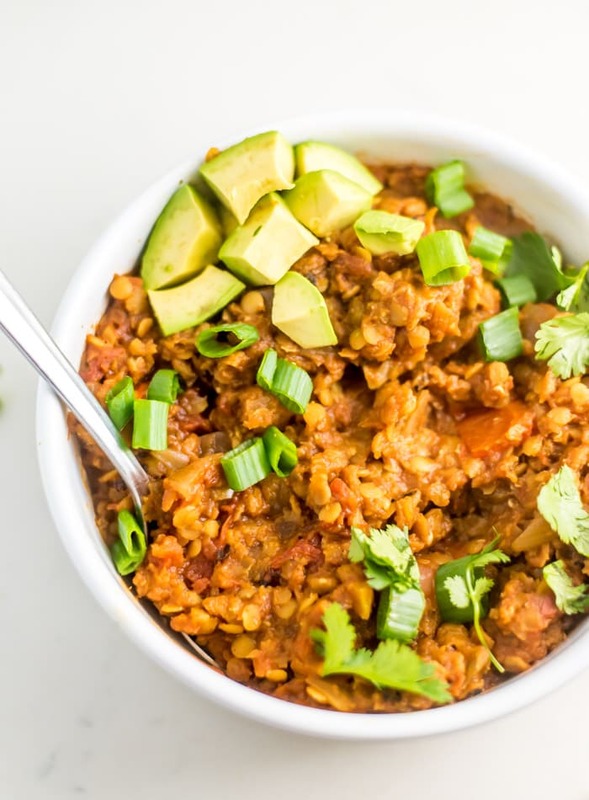 Since this chili is made with just red lentils, the texture is a bit different than a traditional chili. It’s kinda mushy as that’s how red lentils cook. 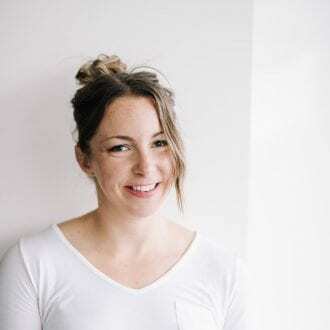 To make it more chunky, I’d suggest adding one or two cans of other beans such as black beans, kidney beans or navy beans, mixing them in once the lentils are finished cooking. 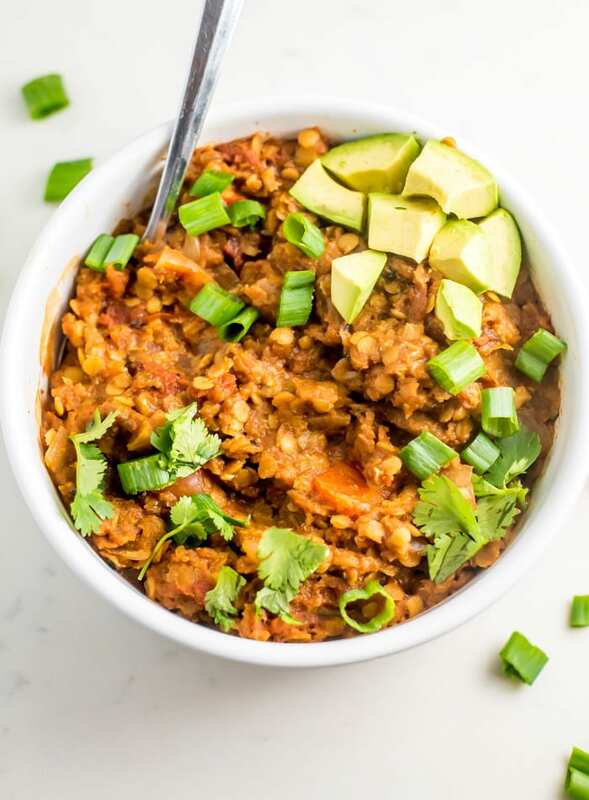 This vegan red lentil chili is so easy to make in a slow cooker. You’ll need less than 10 minutes of prep before throwing everything in the crock pot and forgetting about it until dinner time. So easy! It’s also high in protein and fibre, low in fat, vegan and gluten-free. Add all of the ingredients to a slow cooker and cook on high for 3 hours or low for 5-6 hours. Serve right away or store in the fridge for up to 5 days or freezer up to 3 months. You can make this recipe stovetop as well. Simply add everything to a pot and simmer lightly for 25-30 minutes until the lentils are tender and it’s nice and thick. I may have to finally learn to use my slow cooker (and actually locate it..). 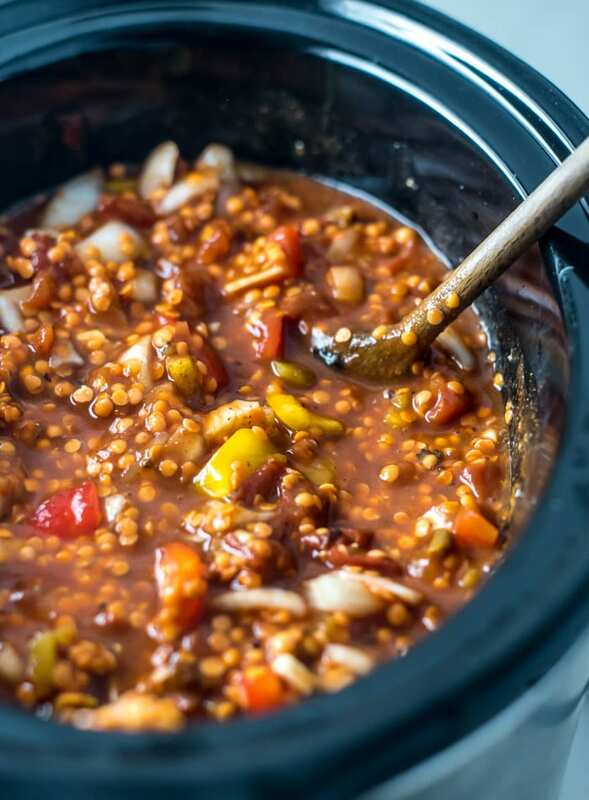 I personally love the texture of red lentils but black beans would be a great addition – they’re cheap and so so good for you. Oatly do an incredible creme fraiche which doubles as a perfect vegan sour cream, though I’m not sure if it’s available outside the UK. It’s a great alternative if you have a terrible blender like me and get gritty results from blending cashews. Wow!! 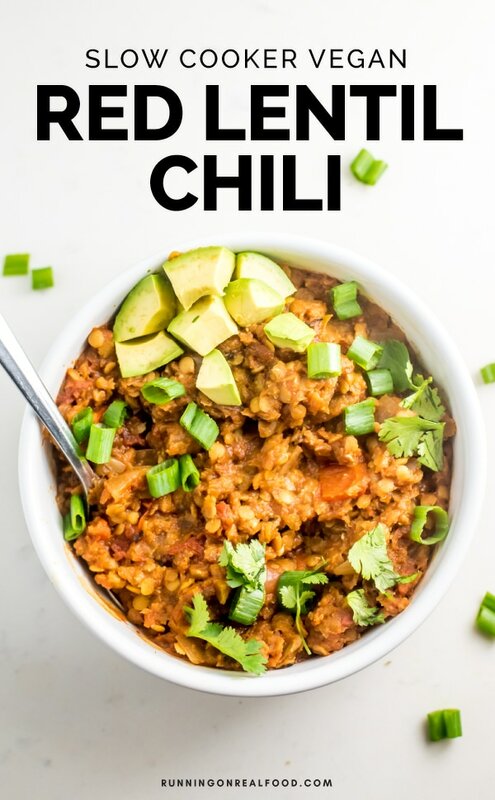 This is THE MOST delicious vegan chili I’ve ever had – and I’ve made quite a few! I love how all the flavors come together! 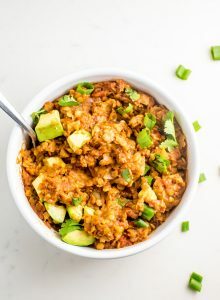 I added pinto and kidney beans and the lentils really give it a hearty/meaty taste! the whole family loved it! Thank you!!!! Awesome. So happy you and your family enjoyed it!! Love the bean addition, they totally do make it a heartier. Thank you so much for your comment! I tried this last night and it was soooooo delicious! I doubled the recipe (have a large slow cooker) and added black beans, kidney beans and sweet potato. Will definitely be adding this to my favourites. Such a lovely winter meal. Thank you Deryn, Love your recipes and You are the go to website when I am looking for ideas. I love all your additions! It sounds so hearty and filling. Thanks a lot for the review. I’m so glad you enjoyed the recipe! This is a great meal planning recipe. Throw everything into the slow cooker and you end up with tons of chili to eat through the week! It’s super hearty and delicious. I just added some hot sauce since my jalapeno wasn’t hot enough for me! That’s awesome, Shira! I agree, such a good recipe for meal prep. 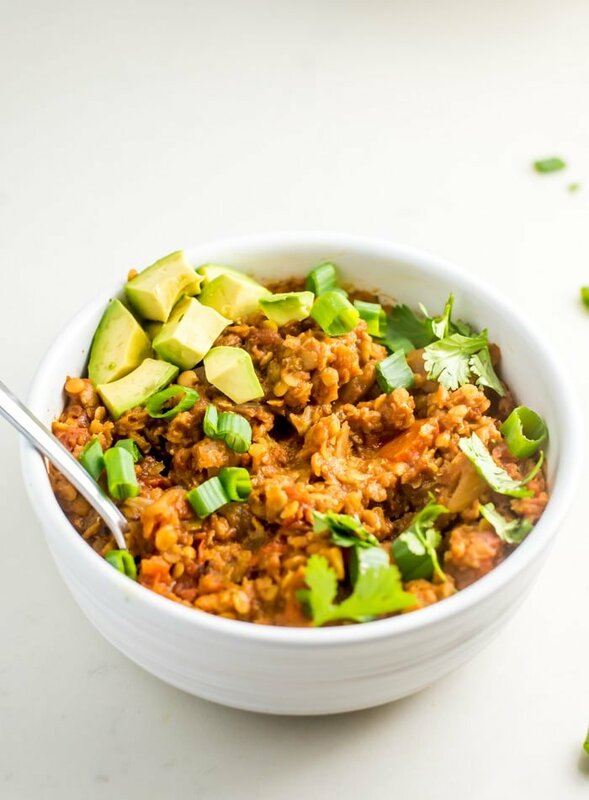 I made this recipe using the slow cooker method and it was amazing!!! I did a few tweaks based on what I had in the house. I used fire roasted diced tomatoes and omitted the jalapeño. I added red kidney beans at the end as suggested and I also added about two cups of chopped baby spinach at the end (i stirred it in with the kidney beans and put the cover back on and left the slow cooker on warm for about a half hour stirring it once or twice to get the spinach to soften). I served it with “sour cream” and avocado. Going it the monthly rotation. Thank you for this recipe! That sounds fantastic!! Love those additions. So happy you enjoyed the recipe. Thanks for the rating, I appreciate it!